The ALGENIST Genius Ultimate Anti-Ageing Eye Cream delivers targeted anti-ageing care for the delicate eye contour, seeking to hydrate, soften and nourish with age-defying effects. The rich formula contains ALGENIST’s exclusive biotechnology complex of Alguronic Acid and Microalgae Oil; a pair of sustainably sourced, marine-based actives that have been scientifically proven to demonstrate significant anti-ageing properties. Seeking to repair and protect cells while enhancing moisture levels, the pair work in tandem to alleviate the appearance of wrinkles and expression lines. 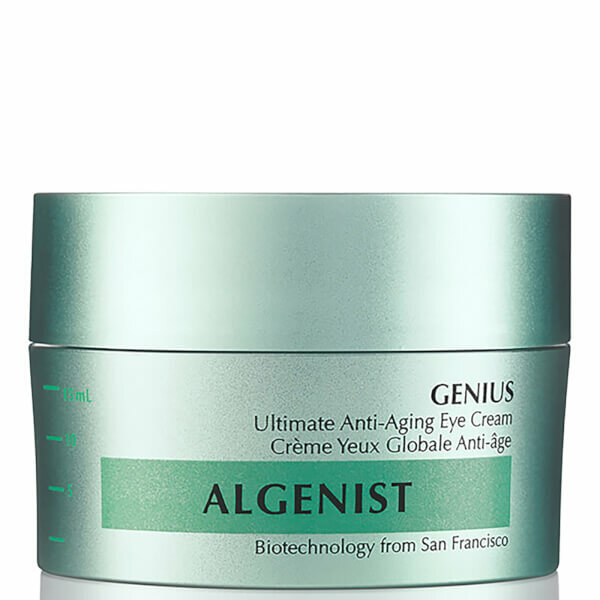 Providing 360° action, the addition of plant-derived Collagen and Persian Silk Tree extract help to firm and lift the upper eyelid, visibly reducing under-eye sagging, bags and dark circles. As a result, the eye cream leaves skin looking supple and refined with a more even and brightened tone. After cleansing, apply to eyelid working up to the brow bone in gentle patting motions. Apply along crow's feet and lower contours of the eyes. Apply twice a day. Use only as directed. Water (Aqua), Caprylic/Capric Triglyceride, Glycerin, Butyrospermum Parkii (Shea) Butter, Hydrogenated Polyisobutene, Chlorella Protothecoides Oil, Dimethicone, Glyceryl Stearate, PEG-100 Stearate, Cetearyl Alcohol, Cetyl Alcohol, Pentylene Glycol, Silica, Algae Exopolysaccharides, Vegetable Collagen, Algae Extract, Palmitoyl Oligopeptide, Palmitoyl Tetrapeptide-7, Copper Lysine Prolinate, Methyl Glucoside Phosphate, Albiza Julibrissin Bark Extract, Kigelia Africana Fruit Extract, Plantago Lanceolata Leaf Extract, Chrysin, Darutoside, Sodium PCA, Leuconostoc/Radish Root Ferment Filtrate, Stearic Acid, Ceteareth-20, Caprylyl Glycol, Steareth-20, Acrylates/C10-30 Alkyl Acrylate Crosspolymer, Butylene Glycol, Sodium Benzoate, Potassium Sorbate, Xanthan Gum, Chlorhexidine Digluconate, N-Hydroxysuccinimide, Chlorphenesin, Sodium Citrate, Disodium EDTA, Citric Acid, Sodium Hydroxide, Phenoxyethanol.